Is drunk driving a bigger problem during holidays? Since starting our Firm, we noticed a significant increase in the number of injuries and deaths as a result of drunk driving over the holidays. To help combat this dangerous trend, our Firm created the No DWI free Holiday rides program to encourage people in our community to not drink and drive. 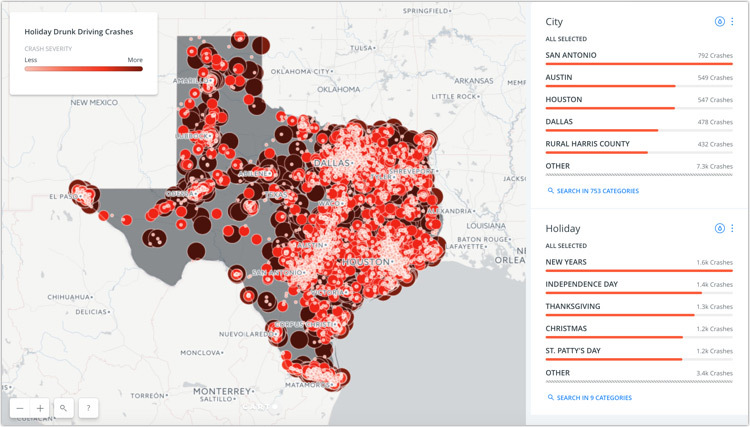 To bring further awareness to what we were seeing, Sutliff & Stout partnered with Juris Digital to research and analyze the last five years of Texas crash data to determine just how much of a problem drinking and driving is during the holidays. Which holidays were most dangerous in terms of alcohol involved crashes. Below is a complete breakdown of our key findings including; the overall increase in drunk driving crashes over the eight holidays we examined; an infographic which conveys the rate of drunk driving crashes, deaths, and injuries during holidays compared to non-holidays; an interactive map which shows every alcohol involved holiday crash in Texas from 2012–2016, and; ranked lists of the most dangerous cities and holidays for drunk driving in Texas. These numbers are based on a comparison of crashes that occur during holiday periods with crashes that occur during non-holiday periods. For more information on how these figures were determined see the methodology. As you can plainly see in the infographic below, alcohol related crashes, fatalities, and incapacitating injuries all occur at a higher rate during holiday periods than during non-holiday periods. The map below contains every alcohol involved crash in Texas for each of the eight holidays examined here. On the map, larger and darker circles indicate a more severe crashes. Click on any circle to view more information about each crash. Use the widgets on the right-hand side of the map to filter by city and by holiday. For example, to view all crashes on New Years in Houston, click on Houston under the Cities widget and New Years under the Holiday widget. You can also search for a specific city or holiday by clicking the magnifying glass beneath each widget. The table below ranks all Texas cities by their holiday drunk driving danger score (see the Additional Notes below for the formula used to calculate danger score). The table below ranks each of the eight holidays by their drunk driving danger score. For each holiday we gathered three days of data: The day before the holiday, the day of the holiday, and the day after the holiday. For example, all data for Christmas includes alcohol involved crashes on December 24th, 25th, and 26th. We then gathered the same data for the same three day period, but for the week after the holiday week (with the exception of Christmas, which we compared against the week before, since the week after would overlap with New Years). This data serves as the control. For example, the control data for Independence Day is from July 11th, 12th, and 13th. This allowed us to compare alcohol involved crashes over holiday periods with alcohol involved crashes during non-holiday periods. To calculate the danger score for each city and holiday, we weighed each crash as 1 point, each injury as 2 points, each incapacitating injury as 5 points, and each fatality as 10 points. Questions about this study? Email us.